What is the greatest event in American History? I think one of the things that Fred continues to remind me is taking more time to be quiet and think. Slow down and have more moments of quiet humility. I think Fred is right on the money; most of life’s big decisions especially the life changing ones are done in those still quiet moments. I think one of the best examples of this is the acceptance speech Fred gave when he received his lifetime achievement award. This is one the most moving and inspirational video I have seen. If any video can change history I think this is one can. I hope you enjoy it. 2 Responses to What is the greatest event in American History? How indicative of the kind of person he was that he chose to spend his time in the spotlight thinking about others! This quote is fantastic and such a great reminder about our own lives too. It’s not ususally the gigantic choices like where to go to college or who to marry or things like that which determine the ultimate path of our lives (although they certainly do play a big part!). I think it is the small day to day choices and actions that shape us and the direction we go in. 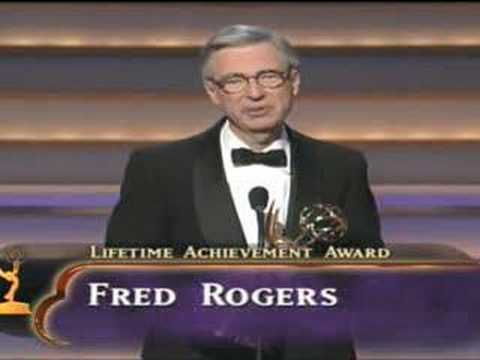 Mr. Rogers means something different to me now than he did when I was a kid. Today he reminds me of how proud and selfish I have become. His great humility and higher perspective makes me want to be a better person. I want to measure greatness the way he did.